This is my eulogy for Fox News. I remember Fox News Sunday when Tony Snow was hosting it. It was balanced and informative. That has changed in recent years. I enjoy Tucker Carlson. I understand we may not agree on everything, but he is fair, logical, and informative. I used to enjoy Hannity and Colmes when they debated both sides of an issue. I guess the fairness and balance of Fox News will be a distant memory. The Los Angeles Times posted an article yesterday about some changes to Rupert Murdoch’s 21st Century Fox as it prepares for a merger with Walt Disney Company. 21st Century Fox created a new company, Fox Corp., made up of Fox News Channel and Fox broadcast network. Yesterday The Washington Post reported that Paul Ryan will be a board member for Fox Corp., the new parent company of Fox News. Last week, Ryan reportedly told a crowd during a lecture in Vero Beach, Fla., that the Democrat who defines the race as one about Trump and Trump’s personality could beat him. But he quickly backtracked on Twitter to clarify that he believes Trump deserves to win. Ryan will serve on the seven-member board along with Murdoch, Fox’s founder, and his son, Lachlan Murdoch, Fox’s chairman and chief executive. I believe the choices currently being made will be the end of Fox News as the most-watched news network in America. Fox News posted an article today about Charles Krauthammer, a longtime regular panelist on various Fox News shows. In August of last year, I underwent surgery to remove a cancerous tumor in my abdomen. That operation was thought to have been a success, but it caused a cascade of secondary complications– which I have been fighting in hospital ever since. It was a long and hard fight with many setbacks, but I was steadily, if slowly, overcoming each obstacle along the way and gradually making my way back to health. This is a man I do not always agree with, but for whom I have a great deal of respect. We need a miracle here. We May Be Working With The Chinese To Rein In North Korea, But Is China Working With Us? Yesterday Fox News reported that China has been secretly selling oil to North Korea, despite promising to uphold the United Nations boycott of North Korea. 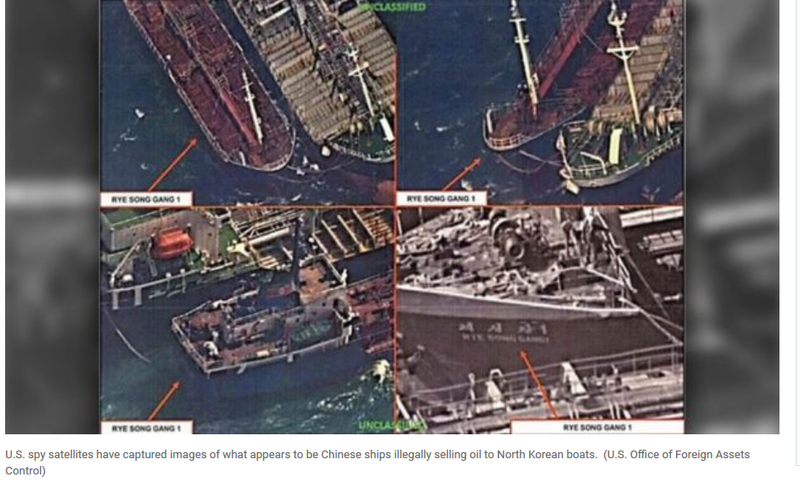 Satellite images released by the U.S. Department of Treasury appeared to show vessels from both countries illegally trading oil in the West Sea, The Chosun Ilbo reported Tuesday, citing South Korean government sources. North Korea was barred in September by the United Nations Security Council from importing natural gas and had its crude oil imports capped in response to Kim Jong Un’s nuclear missile program. China is one of the permanent members of the United Nations Security Council. If it is not willing to uphold the resolutions of the United Nations, why are they a member. It seems as if the United Nations is on a campaign lately to show how totally irrelevant it has become. CNN caught lying about Donald Trump, Jr.
ABC News spreads lie about Mike Flynn proving Trump colluded with Russia. Reuters, Bloomberg, Wall Street Journal spread lie about Trump bank subpoenas. MSNBC‘s Brzezinski questions accuser with photograph of Franken groping her. CNN’s Alisyn Camerota says anti-Trump Russian Dossier is ‘corroborated’. PolitiFact spreads lies about Breitbart, Roy Moore accuser’s forgery. Facebook flags Breitbart’s 100 percent accurate story, does not flag CNN’s fake news. Washington Post handwriting expert debunked by Moore accuser. New York Times falsely claims Secretary of State Tillerson will be forced to resign. None of these stories are true, yet all were reported by the mainstream media and theoretically believed by the Americans who depend on the mainstream media for their news. We have reached the point where you are more likely to read accurate news on the Internet than on the major networks. That is sad. I am posting this video because I was very concerned about a report I heard on Fox News this morning. A commentator was talking about the recent firing of Matt Lauer. He also mentioned Roy Moore in his comments, making the assumption that Roy Moore was guilty. I would like to point out that Roy Moore has been a public figure for more than twenty years, and none of these charges have been previously reported. I would also like to note that none of the charges are less than thirty-five years old. I think a presumption of guilt in this case is not justified. The connections of some of Roy Moore’s accusers and their past activities further cast doubt on these accusations. Was The Obama Administration Using The Government To Spy On Americans? The Washington Examiner is reporting today that former United Nations Ambassador Susan Powers requested the unmasking of more than 260 Americans‘ identities during the waning days of the Obama Administration. These were conversations captured inadvertently while non-citizens were being wiretapped (theoretically). Susan Powers is scheduled to testify before Congress in October. It is suspected that the official referenced is Power. Power also was one of three top Obama administration officials named in subpoenas received by several of the nation’s intelligence agencies in May. Power is not the first U.N. ambassador to make unmasking requests, but Fox News reports the requests fall in the low double digits. Power will meet with congressional intelligence committees as part of their Russia probes and is expected to appear before the House intelligence panel in a classified session next month. It will be interesting to see exactly who winds up taking the fall for the abuses or power that occurred during the Obama Administration. Fox News is reporting today that two dangerous inmates who escaped from a prison in Georgia have been apprehended. Tennessee Highway Patrol spokesman Lt. Bill Miller said late Thursday that the homeowner caught Donnie Rowe and Ricky Dubose trying to steal his vehicle. Miller says the escaped Georgia inmates had crashed a car while being chased by law enforcement and fled on foot into woods along Interstate 24 near the rural community of Christiana. Miller says something alerted the homeowner that people were outside his home and he saw the men trying to steal his vehicle. The trooper says the homeowner held the two at gunpoint with a neighbor he called until the Rutherford County Sheriff’s Department could get there to arrest them. An armed citizen, using his gun responsibly, held the men until the police could get there. Actually, the Second Amendment was designed to protect the American citizens from a tyrannical government that might arise in the future, but this case illustrates that there are some other advantages to having an armed citizenry. Partisanship in Washington is a way of life, but it can also be a serious problem when there is a crisis. It would be nice to believe that both sides of the aisle can work together if they have to in a crisis. Unfortunately, we may be about to find out if that is possible. Fox News is reporting today that the entire U.S. Senate has been invited to the White House on Wednesday for a briefing on the North Korean situation. It is rare for the entire Senate to be invited to such a briefing. Spicer (White House Press Secretary Sean Spicer) clarified that while the event will take place on the White House campus, it is technically a Senate briefing and Majority Leader Mitch McConnell, R-Ky., is the one who convened it. The briefing, first reported by Reuters, was confirmed after President Trump earlier spoke to the leaders of both China and Japan. I believe that this is an attempt at working together, and working together is desperately needed right now. “You just don’t see the United Nations, like, solving conflicts. I think that’s going to start happening now,” he said. Bill O’Reilly has departed from Fox News amid charges of sexual harassment and payoffs for past charges of sexual harassment. The departure of Bill O’Reilly was the result of an orchestrated attack to convince advertisers to withdraw their advertising from the show. It had much more to do with politics than it did with sexual harassment (story here). Now that Bill O’Reilly is gone, the attack has moved to Sean Hannity, another very popular host on Fox News. Yesterday The Blaze reported the latest events. The radio segment started with Campbell (Pat Campbell, an Oklahoma radio talk show host) asking Schlussel (attorney/blogger Debbie Schlussel) if she experienced or witnessed any inappropriate behavior during her time at Fox News. “Only by Sean Hannity, not by Bill O’Reilly,” Schlussel replied. At the core of Schlussel’s charges is her claim that Hannity attempted to get her to come to his hotel room before and after his appearance in Detroit. Schlussel alleges her refusal to accept Hannity’s invitation doomed her from future appearances on the popular program. “LET ME BE CLEAR – THE COMMENTS ABOUT ME ON A RADIO SHOW THIS WEEK by this individual are 100% false and a complete fabrication. This individual is a serial harasser who has been lying about me for well over a decade. The individual has a history of making provably false statements against me in an effort to slander, smear and besmirch my reputation. The individual has not just slandered me over the years but many people who this individual disagrees with. This individual desperately seeks attention by any means necessary, including making unfounded personal attacks and using indefensible and outrageous political rhetoric. My patience with this individual is over. I have retained a team of some of the finest and toughest lawyers in the country who are now in the process of laying out the legal course of action we will be taking against this individual. The article at The Blaze also notes that this woman had previously made false accusations against Hannity for his activities with the Freedom Alliance. There is an attempt by the political left to shut down any conservative media that is having an impact. In this world of political correctness and lawfare, it is relatively easy to make accusations that will tie a person up for years with legal actions that will be very expensive. The best way to handle this behavior is to expose it whenever it appears. Hopefully the lawyers that Sean Hannity has hired will be able to teach an object lesson about false accusations and using lawsuits to stop opposing speech. Schlussel clarified her accusation in a Monday interview with LawNewz. She now insists that Hannity’s actions did not constitute “sexual harassment,” but they were still “creepy” nonetheless. “I would never accuse him of that. Sexual harassment has a special meaning under the law, and I would never accuse him of that,” Schlussel said. “I never thought I was sexually harassed by Sean Hannity, I thought he was weird and creepy not someone I liked,” she added. Simply amazing. A good lawyer is worth his weight in gold! Free speech is part of the fabric of American political discourse. In recent years it has been seriously under attack by the political left. That attack also involves some serious double standards. First, I would like to address the double standard. Bill O’Reilly has been fired from Fox News for sexual harassment. Evidently he made inappropriate remarks to women at Fox over the years. Remarks. Inappropriate remarks–but remarks. I don’t condone that, but I seriously question whether he should have lost his job. President Clinton did far worse (even in the Oval Office) and did not lose his job. So remarks are worse than actions. The specific circumstances of Bill O’Reilly’s firing get even more interesting. Paul Mirengoff at Power Line shared some interesting details today. I very much doubt that the decision to fire O’Reilly was driven by the facts of his conduct. In all likelihood, it was driven by sponsor reaction. In other words, it was the product of corporate America — spineless and liberal as ever — and left-wing groups that exploit these weaknesses. …The conventional wisdom is that after the NY Times exposed a history of sexual harassment settlements, and two new accusers came forward, advertisers “fled” the show, forcing the hand of News Corp and the Murdochs. …The use of organized attacks on advertisers will continue, and will be used against conservative personalities who are not accused of anything near what O’Reilly was accused of. There’s blood in the water now. This is disturbing. Fox News has moved toward the center since Roger Ailes left. However, it is still a good place to get conservative commentary on occasion. It is a valid news source despite the political left’s attempts to discredit it. The attack on Bill O’Reilly is part of an orchestrated attack on Fox News by Media Matters. Stay tuned. I am sure there is more to come. The Independent Journal Review posted a story today about a young boy who started a fire outside the National Press Club during the protests in Washington, D.C.
“Why did you start the fire?” Fox News reporter Griff Jenkins asked. “Because I felt like it, and because I’m just saying, ‘Screw our president! '” the boy responded. Lord, help us if this is the next generation of Americans. Yesterday The Gateway Pundit posted an article about Major General Errol Schwartz, the head of the Washington, D.C. National Guard. The article cites a Washington Post story about General Schwartz’s resignation. “The Army general who heads the D.C. National Guard and has an integral part in overseeing the inauguration said Friday that he will be removed from command effective at 12:01 p.m. Jan. 20, just as Donald Trump is sworn in as president. Maj. Gen. Errol R. Schwartz’s departure will come in the middle of the presidential ceremony — classified as a national special security event — and while thousands of his troops are deployed to help protect the nation’s capital during an inauguration he has spent months helping to plan. “The timing is extremely unusual,” Schwartz said in an interview Friday morning, confirming a memo announcing his ouster that was obtained by The Washington Post. During the inauguration, Schwartz will command not only members of the D.C. Guard but also 5,000 unarmed troops dispatched from across the country to help. He also will oversee military air support protecting Washington during the inauguration. However, that’s not actually what is going on. The Washington Post has changed its story. The Trump administration told FOX News of Friday the story is a crock. Schwartz was offered to stay on his post until after the Inauguration but decided to quit during the ceremony and then he ran to the press to complain. The Washington Post completely rewrote their story since it was originally posted without any mention of an update. We need to be aware of what is happening here. The mainstream media remembers the time when they were able to bring down a sitting President (Richard Nixon) by constantly tearing him down. When you go back and read some of this history of Watergate, you discover that it was a case that should have been over in two months, but behind the scenes in Congress many former members of Bobby Kennedy’s Justice Department were engaged in a strategy to delay indictments and prolong hearings in order to bring down the President and the Republican party. Their long-term goal was to prepare the way for Ted Kennedy to become President. What we are seeing now in the mainstream media today is simply another example of the press trying to create opinions rather than to report news..
We are undergoing a peaceful transition of power. It would be wonderful if those who supported Hillary Clinton during the election would remember that Donald Trump won and Hillary Clinton lost. This is the time for working together for America. This is not the time for unending attacks on the new President. Fox News posted a story yesterday about missing evidence in the Hillary Clinton email investigation. Buried in the 189 pages of heavily redacted FBI witness interviews from the Hillary Clinton email investigation are details of yet another mystery — about two missing “bankers boxes” filled with the former secretary of state’s emails. The article goes on to report that the missing boxes cover the period from January-April 2009. The emails from this time are particularly critical because they cover the beginning of Hillary Clinton’s tenure as Secretary of State and the time that she would have been setting up her private email server. Somehow all of those emails have disappeared. The Gateway Pundit also posted an article about the missing emails yesterday. Destroyed and missing evidence, evidence tampering, cell phones destroyed with hammers, secret meetings on airplanes, etc., etc., etc. How does our media react? Look! Trump said something mean about a beauty queen 20 years ago! I am willing to bet that voters who rely on the mainstream media for their news have no idea of the extent of the email scandal or the cover-up. Instead they are busy listening to 10-year old comments from Donald Trump. What about the words Hillary Clinton used in addressing her Secret Service detail? The hand that will be on the nuclear button is the same hand that is documented to have thrown a vase at Bill Clinton. Watch your news sources–we are in danger of majoring in the minors. Chutzpah is a Yiddish word meaning shameless audacity; impudence. Every now and then, I find a really good example of the concept. Yesterday Fox News posted a story about a group of refugees suing a school district in Pennsylvania because they feel that the district is not providing the quality of education they are entitled to. I would like to point out that there are also American students who were not permitted to attend McCaskey High School who attend the Phoenix Academy. Why should the refugees get preferential treatment? Officials for the school district say the six students were sent to Phoenix for a special program geared towards their needs. A special “acceleration program” at Phoenix was created for under-credited students, both refugee and non-refugee, which gives them the opportunity to earn credits toward a high school diploma by the age of 21, Rau said. At Phoenix, the students receive various services including remedial services, English classes for Second Language Learners, after school programs, job and computer skills as well as mentoring services, Rau added. I wish the refugees well, but I find it rather amazing that a lawsuit would be brought when you consider that these refugees are being given a free education and whatever aid they need to help them settle here. I am sorry that they have been placed in a school that may not be the best in their city, but it seems to me that they need special classes in English and other skills that the school they are attending is providing. I really think that suing the school district is tacky. The idea that we are all Americans working together for the good of our country has somehow been lost in recent years. We have lost our identity as a nation and are sacrificing the lives of our military as a result. Regardless of how you felt (or feel) about the war in Iraq (or realize that one of the main reasons we went into that war was to salvage the UN peace deal that had been worked out with Saddam Hussein), leaving the war the way we did caused problems. What has come to light in the past few days is the fact that the Obama Administration has been lying to Americans about the progress made against ISIS since we left Iraq after the war. Yesterday Fox News posted a story about the findings of a House Republican task force regarding what Americans have been told about ISIS. Intelligence reports produced by U.S. Central Command that tracked the Islamic State’s 2014-15 rise in Iraq and Syria were skewed to present a rosier picture of the situation on the ground, according to a bombshell report released Thursday by a House Republican task force. The task force investigated a Defense Department whistleblower’s allegations that higher-ups manipulated analysts’ findings to make the campaign against ISIS appear more successful to the American public. Those of us with family members in the military need to remember this when we vote in November. For whatever reason, the Democrats record on military issues–defense spending, military benefits, VA hospitals, etc.–is horrendous. If you want the American military to remain strong, you have no alternative but to vote Republican. One of the names that has surfaced in the leak of Hillary Clinton’s emails (many of which were deleted from her computer because she said they were not work related, but have come to light through Judicial Watch) is Gilbert Chagoury. Breitbart posted a story about this man today. The mainstream media has been somewhat quiet about him. Yesterday, Fox News posted a story about some of the links between emails regarding the Clinton Foundation and Hillary Clinton’s role as Secretary of State. In one email exchange released by Judicial Watch, Doug Band, an executive at the Clinton Foundation, tried to put billionaire donor Gilbert Chagoury — a convicted money launderer — in touch with the U.S. ambassador to Lebanon because of the donor’s interests there. …Chagoury is a close friend of former President Bill Clinton and has appeared on the Clinton Foundation donor list as a $1 million to $5 million contributor. He’s also pledged $1 billion to the Clinton Global Initiative. Chagoury was convicted in 2000 in Switzerland for money laundering. He cut a deal and agreed to repay $66 million to the Nigerian government. In 1996, Gilbert Chagoury donated $460,000 to a controversial Miami-based Democratic voter-registration group called Vote Now 96. As a foreign citizen, Chagoury is barred from donating directly to elected officials or political parties. But his three contributions of $200,000, $10,000, and $250,000, made in September and October 1996, were completely legal because Vote Now 96 was a nonprofit organization. Just two months after making his six-figure donations, Chagoury was among the 250 guests who attended the Clintons’ White House Christmas party. …In 2000, Switzerland convicted Chagoury of money-laundering and “aiding a criminal organization in connection with the billions of dollars stolen from Nigeria during the [Sani] Abacha years” of military dictatorship, according to a PBS Frontline report. It is also worth noting that Chagoury’s company, the Chagoury Group, pledged $1 billion to the Clinton Global Initiative in 2009, the same year the Clinton Global Initiative awarded the Chagoury Group its annual prize for “sustainable development.” The money pledged was at the heart of Sen. David Vitter’s (R) probe into whether Chagoury’s cozy relationship with the Clintons played a roll in Clinton’s State Department’s delay of a Foreign Terrorist Organization (FTO) designation on Nigerian Islamist group Boko Haram; an FTO classification would have severely hampered Chagoury’s business endeavors in Nigeria. We really do not need Hillary Clinton to bring this sort of corruption into the White House. Ted Cruz‘s speech last night was a mistake–his making a speech was not a mistake–what he said was a mistake. Echoing the iconic moment from the first debate of the cycle, Marco Rubio, Ted Cruz, John Kasich and Donald Trump all agree to definitely support the Republican nominee, no matter who it is, at Thursday’s GOP presidential debate on the Fox News Channel. RUBIO: I’ll support the Republican nominee. …BAIER: Senator Cruz, yes or no, you will support Donald Trump is he’s the nominee? …BAIER: Governor Kasich, yes or no, would you support Donald Trump as the Republican nominee? KASICH: Yeah. But — and I kind of think that, before it’s all said and done, I’ll be the nominee. …WALLACE: Yes, you will support the nominee of the party? TRUMP: Yes, I will. Yes. I will. There were a few moments during the campaign when it looked as if Donald Trump was going to disavow that pledge, but generally speaking, he stayed with it. Governor Kasich and Senator Cruz simply chose not to keep their pledge. Governor Bush was also conspicuous in his absence from the Republican Convention. I believe Donald Trump is the only logical choice for President right now. I believe he will support the U.S. Constitution, and he obviously loves America. I was truly disappointed in Ted Cruz’s speech last night. I believe Senator Cruz is a good man who simply made a bad decision in making that speech. As for the other Republicans who are behaving like two-year olds, they need to get over themselves and help elect Donald Trump. The irony here is that there is a strong possibility that Donald Trump will not run for a second term if he is elected. The behavior of some Republican leaders now will determine if the American people are willing to vote for them in the 2020 primary elections. The Washington Examiner posted an article today about a recent vote by the Federal Election Commission. One of the candidates left out filed a complaint to the FEC, charging that Fox was essentially making a contribution to the 17 candidates by letting them have a voice in the debate. CNN did the same thing, but there is no indication that they faced a complaint. The quote “Eternal vigilance is the price of liberty” is attributed to Thomas Jefferson. Regardless of who made the statement, the quote applies to today. There are Americans who want to take away our First and Second Amendment rights. We need to watch the votes in Congress and the Congressional appointments and remove those people from office at the first opportunity to vote.